Call for details about upcoming dates for this course. Our Granite Restoration and Polishing class is scheduled upon request. If you are interested in taking this course, contact us online or call (407) 567-7680. This course offers intensive hands on training for stone restoration contractors who are currently in the marble restoration business but have not yet mastered the granite business. 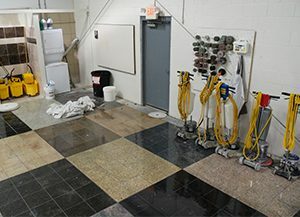 During this class you will learn basic granite restoration and granite polishing processes for floors and countertops, including how to determine whether the granite needs honing or polishing. There will be no more than five students in each class. That means you will have your own equipment and work space and plenty of opportunity to interact with the instructors, John Freitag and Doug Nelson.